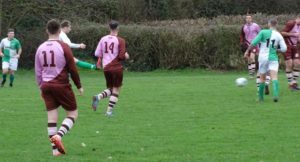 The 1st team of Icklesham Casuals reached the quarter finals of the Hastings Junior Cup with a convincing 10-2 victory over Bexhill Broncos at the Recreation Ground on Saturday, January 12. Joe Fraser opened the scoring in the 10th minute, receiving a pass from Sam Norman and firing an unstoppable left footed shot into the top corner of the net. Five minutes later Jack Pullin played an excellent long ball to Liam Sayer who crossed for Phil Badrock to finish with Fraser making it 3-0 in the 18th minute when he shot home from 15 yards. Bexhill Broncos reduced the arrears in the 40th minute with a neat finish following a corner, only for Badrock to restore the three-goal advantage when he headed in a corner at the other end in the final minute of the half. Sayer made it 5-1 on 50 minutes with a fine individual goal, cutting in from the left and shooting low into the net. Ed White then got the first of four goals in a seven-minute spell when he converted a cross from Fraser in the 72nd minute. Norman finished when put through, Adam Sully shot home from the edge of the area and Norman netted again from close range to take the lead to 9-1. On 89 minutes, it was Badrock’s turn and the shot struck the crossbar with Norman on hand to head home the rebound to complete his 16-minute hat-trick. Bexhill Broncos then netted their second goal with the final kick of the match. The reward is an away tie with Bexhill United II. The 2nd team were without a game but both teams are in action this weekend with the 1st team taking on Mountfield United at home in the league and the 2nds away to Sovereign Saints II in the quarter final of the Cooper’s Construction Challenge Cup.